Organized by Hope students, the high-energy, 24-hour event was conducted on behalf of Helen DeVos Children’s Hospital in downtown Grand Rapids, both to raise funds and to build awareness of the hospital’s work. 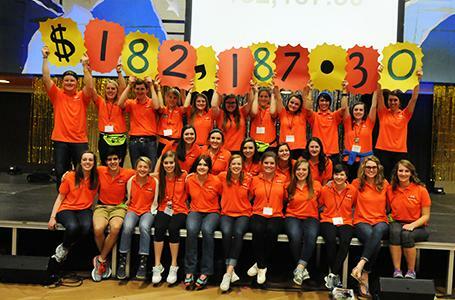 Dance Marathon is the largest fundraiser for the hospital. Helen DeVos Children’s Hospital board chair Patricia Betz and trustee Lou Anne Gaydou were on hand to express their gratitude for the students who had just spent 24 hours on their feet. “Keep dreaming, keep dancing and keep inspiring us, because you are heroes for our kids—and we love it,” Gaydou said. The main portion of Dance Marathon began with a kickoff celebration on Friday, March 6, at 7 p.m., with live coverage on WOTV. It formally concluded with a ceremony at 5 p.m. on Saturday, March 7. More than 900 Hope students participated in the 16th annual event as dancers, morale boosters and organizers. To emphasize the children that the marathon exists to help, the Dance Marathon’s student organizers coordinate a variety of activities during the course of the school year to connect with families and children served by Helen DeVos Children’s Hospital. During the closing ceremony, miracle children and their families shook each participant by hand.